As soon as I knew we were travelling to Los Angeles to attend the launch of the Xbox Kinect I sent an email to one of my favourite bloggers, La Belette Rouge who lives near to LA. I asked if there was any chance of us meeting up whilst we were there, and her immediate response was an enthusiastic 'yes'. The funny thing is, when LBR adopted her gorgeous pooch Lily about 18 months my daughters both fell madly in love with her and wanted me to check the blog everyday for new pictures of Lily. 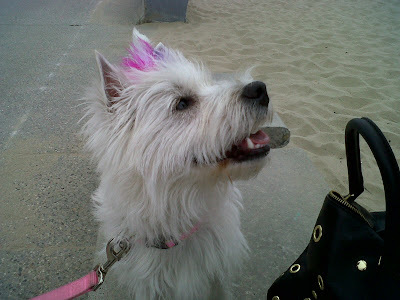 Little did we know that one day we would actually be walking along Venice beach with LBR and Lily! 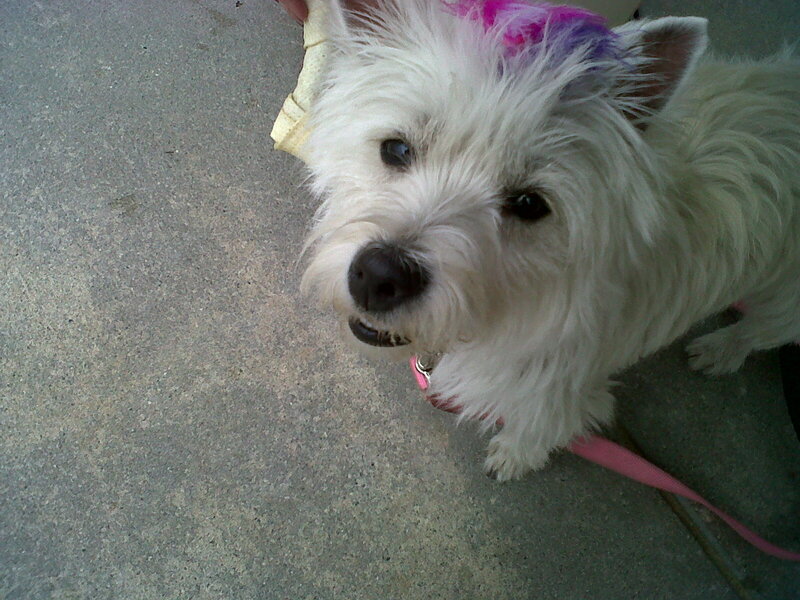 Look at Lily with her feathers in her 'do! I met up with LBR in the lobby of our hotel, and went down to meet her feeling quite nervous - but I needn't have worried as she was so warm and friendly and within minutes we were chatting away like old friends. In fact, she's every bit as wonderful as I thought she'd be. When my girls finally hauled themselves out of the pool and came to meet us downstairs they were excited to finally meet Lily and all five of us took a walk towards Venice beach. We had lunch and the girls fussed over Lily who looked so cute with feathers in her hair! It was a huge treat to meet up with La Belette, and I'd like to thank her again for driving for an hour to meet up with us. Thank you La Belette, you're lush!